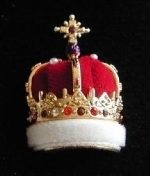 Crowns & Regalia have used their extensive knowledge to design and create a unique range of 1/12th scale miniatures of 'The Crown Jewels of the World'. Hand Made entirely in Great Britain, each piece is hand cast in traditional Pewter, hand polished and richly plated in genuine 22 ct. Gold or Sterling Silver. Most of the pieces are hand enameled, and hand set with minute Austrian Crystal cut jewellery stones, then fitted with a velvet 'Cap of Estate' and Faux ermine. I placed a quarter in the photo of the Imperial State Crown to give you a better sense of the scale. 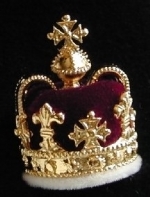 This famous crown is used only once for the coronation of each British Monarch, for the actual crowning. Made of gold, it is set with precious and semi-precious stones and weighs over 5 pounds (2.25 kg). 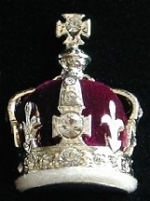 Known to have been made in its present form after the restoration of the Monarchy for the coronation of King Charles II in 1661, it is reputed to contain part of the crown of Edward the Confessor, which dates back to the 11th Century. Last used for the coronation of HM Queen Elizabeth II in 1953, this crown is currently on show at HM Tower of London. Worn by the monarch at the end of the coronation ceremony, and annually at the State Opening of Parliament, this superb crown is virtually priceless because of its major stones, famous either for their historical interest or their actual value. A sapphire set in the Maltese Cross at the top of the crown is said to have been taken from a ring found on the finger of Edward the Confessor when he was re-interred at Westminster Abbey by Henry II in 1163. Among the many other gems are included the huge Black Prince’s Ruby, below which is set the Second Star of Africa diamond (317 cts) cut from the Cullinan Diamond. The crown contains over 2800 other precious gems and pearls. This crown is rather unusual, being the only one in the collection made of platinum. It was made for Queen Elizabeth the Queen Mother for her coronation as Queen Consort in 1937 and contains some 2,800 diamonds, most of which were removed from Queen Victoria's Regal Circlet. 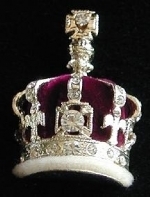 The principal diamond, set in the Maltese Cross at the front of the crown, is the 'Koh-i-Noor'. Traditionally said to date back to Robert the Bruce, the Crown of Scotland was made in its present form present form for James V (father of Mary, Queen of Scots), refashioned in 1540 from a damaged and lighter crown by an Edinburgh goldsmith John Mosman. James wore it to his consort's coronation in the same year at the abbey church of Holyrood. The circlet at the base is made from Scottish gold, encrusted with 22 gemstones and 20 precious stones taken from the previous crown. Freshwater pearls from Scotland's rivers were also used. The crown weighs 3lbs 10oz. This beautiful crown, which is set entirely with diamonds, was made for the coronation of Queen Mary as the consort of King George V in 1911. 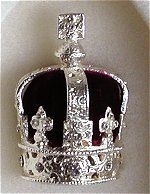 It originally contained the famous and historic Koh-i-Noor diamond - which is now set in the Queen Mother's Crown. The third and fourth largest stones of the Cullinan Diamond were also set in this crown for the coronation. This crown was made in 1728, of silver-gilt, for Prince Frederick Louis, Prince of Wales, the son of King George II. It was used when he took his seat in the House of Lords, where it was placed on a cushion in front of him. It was used by subsequent Princes of Wales in the same fashion, but rarely ever worn. 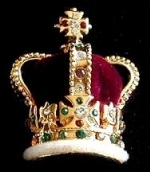 The crown was last used by King Edward VII when he was Prince of Wales. The single arch crown is only worn by a Prince of Wales. In 1870 Queen Victoria, finding the Imperial State Crown too heavy, designed and commissioned this delightful small crown to be made, using some of the diamonds from her own collection - mainly from a large necklace. 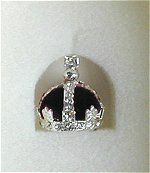 Tiny, just 3.7” (9.9 cm) in height and 3.4” (9cm) in diameter, the crown is set with some 1300 diamonds. The Small Diamond Crown was worn by Queen Victoria on a great number of occasions, including the opening of Parliament. On her death in 1901 the crown was placed on her coffin at Osborne House.